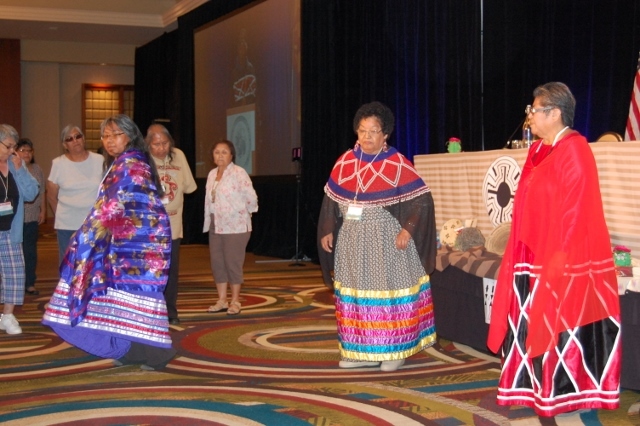 The 20th Biennial National Indian Council on Aging, Inc. (NICOA) Conference took place September 3rd through 6th, 2014, at the Sheraton Phoenix Downtown in Phoenix, Arizona. The NICOA conference was held in partnership with the Inter-Tribal Council of Arizona, and the Area Agency on Aging, Region 8. There were 1,387 elders attending from 65 different tribal nations. The four day affair offered a range of events and activities for participants, speakers, families, and guests. Here are some of the highlights from each day. Wednesday September 3 The first day of the conference began with a whirlwind of activity as many more attendees than expected arrived and were registered. A prayer offered by Delford Stevens opened the conference. The Ira H. Hayes American Legion Post 84 post the colors in a moving ceremony. Veteran Rebecca Norton sang a rousing version of the National Anthem. Randella Bluehouse, NICOA Executive Director (Navajo) and Eddie Tullis, NICOA Board Chairman (Poarch Band of Creek Indians) provided a warm welcome to the members of NICOA and other guests. The NICOA Board of Directors briefed the audience of elders from across the country on some of the most pressing issues facing our Native communities. Travis Lane, (Navajo), the Acting Assistant Director of the Inter-Tribal Council of Arizona, discussed the implications of the federal government’s policies of termination and self-determination. Ron Moore, (Colorado River Indian Tribe), President of the Arizona Indian Council on Aging welcomed NICOA members and guests and acknowledged the many veterans present. Mr. Tullis reminded the voting members to attend the caucuses for their regions and make their voices heard regarding the resolutions that would be voted on Friday, September 5th. Cynthia LaCounte, (Turtle Mountain Chippewa), Director of the Office for American Indian and Alaska Native and Native Hawaiian Programs in the Administration on Aging/Administration on Community Living offered her support and welcome, saying this was one of her favorite conferences. Becky Brimhall-Lepire from the Arizona Governor’s Advisory Council on Aging welcomed everyone. The tremendous support of local Arizona tribal nations was recognized, particularly the Ak-Chin, Tohono O’odham and the Gila River Indian Communities. One of the many plenary speaker highlights of the day was Kimberly Yellow Robe (Rosebud Sioux), from the Social Security Administration, San Francisco Region, who is an American Indian Public Affairs Specialist. She gave a presentation on “Social Security Updates for Elders” and answered audience questions afterwards. Dorinda Fox (NICOA Senior Community Service Employment Program, SCSEP Director) was the moderator for a panel discussion with Sarah Biggers (CEO, Experience Works, Inc.), Darrell Regan (Arizona Mature Worker Programs Coordinator), Tony Sarmiento (CEO, Senior Service America, Inc.), Sharon Dukes (NICOA SCSEP West Region Program Manager), Leslie Rudders and Terri Serein (Senior Services Staff, City of Surprise, AZ). They discussed “The Value and Future of the Senior Community Service Employment Program”. As part of the proceedings, Ms. Fox and Ms. Dukes, in recognition of National Employ Older Workers Week during September (21-27), presented an Employer Award to the City of Surprise, AZ (NICOA SCSEP host agency) for the City’s stellar performance in training and hiring older workers since 2006. Recently retired Senior Center Director Leslie Rudders accepted the award for the City. Former SCSEP Participant Terri Serein shared her story and was honored as a successful employment placement with the City of Surprise. The regional caucuses met on Wednesday afternoon and discussed the NICOA Board of Directors election, the 2015 White House Conference on Aging, and proposed resolutions. Please check our website at https://nicoa.org/about-nicoa/who-we-are/nicoa-board-of-directors/ to see a list of current Board members. Other workshops went on simultaneously. Those that had a little free time browsed the items for the Silent Auction. There were many people throughout the day strolling through the exhibits and Mini Health Fair. There were quite a few people shopping from the vendors selling traditional and contemporary items in the Valley of the Sun Ballroom. A computer lab was also set up in the ballroom and Elders were given assistance in searching the internet by NICOA staff members. Concurrently the Senior Community Service Employment Program (SCSEP) training went on. 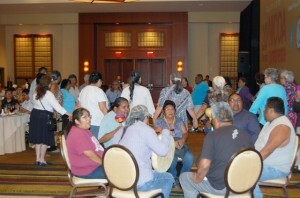 That evening, a cultural dinner featuring traditional foods of the Arizona tribes was held. The delicious dinner was a huge success. Pat Helton, (Shoshone, Peiute, Karok) Chairwoman of the Native American Senior Association presented the Lord’s Prayer in Sign Language. There was traditional singing from the Tohono O’odham Nation and tribal social dances. Many in the crowd joined in. Afterwards, The Steppers, a group of Native women (all over 55) entertained with lively line dancing to contemporary tunes. The women, dressed in bright green shirts with black fringes, jeans, black cowboy hats, and boots soon had the crowd on their feet, dancing right along with them. Copyright 2015 NICOA Inc. All rights reserved. Thursday, September 4 On Thursday, Cynthia LaCounte began the day with an “Update on ACL/AoA Services to American Indian and Alaska Native Elders”. Ms. LaCounte informed members about the virtual format for the upcoming 2015 White House Conference on Aging. Her engaging introduction was followed by a panel discussion on “Agency Network Services to American Indian and Alaska Native Elders”, featuring Cynthia LaCounte, Wilson Wewa (Confederated Tribes of Warm Springs) Coordinator, Title VI, Native American Caregiver Program, Laurai Atcitty (Navajo/Taos Pueblo) ITCA AAA, Program Coordinator, Inter-Tribal Council of Arizona, Inc., Mary Lynn Kasunic, CEO, Arizona AAA Region I, and Lora Church (Navajo), Director IAAA, Albuquerque, NM. Dr. Bruce Finke, IHS M.D. (Family Physician and Geriatrician) has spent much of his career addressing the topics he covered in his presentation, “Long Term Care across Indian Country”. Dr. Babak Nayeri (Executive Consultant – Arizona Healthy Aging) gave a humorous and informative talk on “Falls Prevention – The Pathway to Healthy Living”. A highpoint of the day was the NICOA Honoring Elders/Veterans and sponsorship recognition luncheon. At least 100 AI/AN Veterans were acknowledged individually by name and were each given lapel pins and ribbons. NICOA honors its Elders by presenting service awards. The Advocate for Elders Award went to Lucy Gutierrez, from the Pueblo of Sandia. The Caregiver Award was given to Barbara Johnson, Salt River Pima-Maricopa Indian Community. The Title VI Director of the Year award recipient was Dawn Briner, Otoe-Missouria Tribe. NICOA Administrative Staff Member Gerlinde Voorhis, Payables/Reconciliation Specialist, was acknowledged for 23 years of service in the Finance department. For 15 years, NICOA Staffer Jose Duran has provided his expertise in payroll. The Senior Community Service Employment Program (SCSEP) earned several awards and recognition. Marie Jim, (Navajo), the SCSEP Compliance/Records Manager, received an award for her 20 years of service to NICOA. The West Region SCSEP was honored as the outstanding NICOA SCSEP program of the year. Accepting the award were: Sharon Dukes, Program Manager and her staff: Darrell Begay, Assistant Program Manager, and Renita Etsitty, Program Assistant. SCSEP Director Dorinda Fox acknowledged and thanked the entire SCSEP staff who were present at the conference for concurrent SCSEP training. Kuauhtemoc Rodriguez, (Native American Liaison/Program Analyst, Phoenix VA Health Care System) provided an update on American Indian/Alaska Native Veterans. The workshop sessions continued in the afternoon. There were sessions regarding Medicare, enhanced fitness programs, diet and nutrition, brain health, and the Older Americans Act; to name a few. The evening event was a fashion show. NICOA Board Member Ralph Bennett, Jr. (Navajo) graciously stepped into the MC role and kept everyone laughing and enjoying themselves. Many people modeled their exquisite hand-made traditional clothing and jewelry. Several tribes from across the nation were represented. The stage was quite a sight as the Elders lit up the night and reminded us how special and unique our Native cultures are. Friday, September 5 On Friday, there was a large gathering for the Spiritual Breakfast. 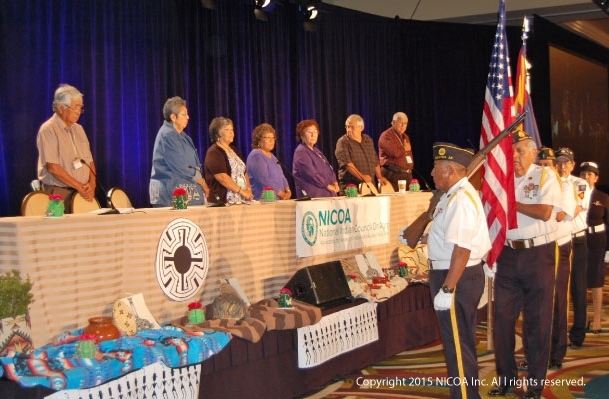 James DeLaCruz, Sr., (Quinault Nation), Vice Chairman of NICOA Board of Directors, offered the opening blessing. There were several choir groups from Oklahoma and each group sang church hymns in their traditional languages. Joseph Enos, (Tohono O’odham Nation), served as the Spiritual Speaker. He spoke to the Elders about caring for their spiritual health. He told them about his own personal journey and his involvement in both the Catholic faith and his O’Odham Hidak (Way of Life). After his moving presentation, many individuals came up and sang hymns. Dr. Yvette Roubideaux, M.D., M.P.H., (Rosebud Sioux Tribe) Acting Director of the Indian Health Service spoke to the audience about “Indian Health Services Updates for Elders”. David Costlow from Walgreens encouraged everyone to get a flu shot. The topic, “What Elders Should Know about the Affordable Care Act and Medicare/Medicaid” was addressed by Alida Montiel, Health Systems Director, and Cynthia Freeman (Navajo), Public Benefits Program Coordinator, both from the Inter-Tribal Council of Arizona, Inc. Dr. Jacque Gray, (Choctaw/Cherokee/Maori), is Associate Director of Indigenous Programs at the Center for Rural Health at the University of North Dakota. She leads the following projects: the American Indian Health Research Conference, the National Indigenous Elder Justice Initiative, the National Institute of Mental Health Outreach Partnership, the National Resource Center on Native American Aging and the Seven Generations Center of Excellence in Native Behavioral Health. She spoke powerfully on “Elder Abuse Prevention in Indian Country”. The voting general session was an opportunity for NICOA members to voice their support or opposition to the various resolutions being presented. Many well-reasoned arguments for and against resulted in 11 resolutions being approved. These resolutions will be forwarded to the National Congress of American Indians for consideration at their upcoming conference in October. (See resolutions on our website, www.nicoa.org) The talent show highlighted the delightful skills, humor and wisdom of our NICOA members. Master of Ceremony Luterio Lopez did a terrific job of keeping everyone laughing as he introduced acts from across the country. A surprise appearance by Tina Turner (Roberta Johnston, Salt River Pima Maricopa Indian Community) and her Native Ladies, lots of great stories, jokes and beautiful songs made for an enjoyable evening. Saturday, September 6 On the final day of the conference, Dr. Marwan Sabbagh, M.D., Director of the Banner Sun Health Research Institute presented information on “Alzheimer’s Disease and Other Dementias. Dr. Nayeri shared his insights on “Alzheimer’s Disease and Caregiving”. Long time NICOA advocate, Robert B. Blancato, President of Matz, Blancato, & Associates, covered “Leading Policy Issues for Aging in Indian Country”. Jacob Moore, (Tohono O’odham, Akimel O’odham, Lakota, and Dakota) Arizona State Board of Education, gave a strong motivational speech, “Elders are the Bridge to the Future”. Randella Bluehouse provided an update on recent NICOA activities and grant projects. She also acknowledged the crucial support of the sponsors for the conference: Ak-Chin Indian Community, Tohono O’odham Nation, Gila River Indian Community, the Arizona Association Area Agencies on Aging, the Region One Area Agency on Aging, and the Yavapai-Prescott Indian Tribe. She also thanked the conference planning committee, volunteers and staff for their hard work. Mr. Tullis announced the new NICOA Board Members and in his closing remarks focused attention on the work of Phyllis Antone, (Gila River Indian Community) NICOA board member, in helping make the conference a success. The retrieval of the colors was completed, marking the end of the 2014 Biennial Conference as we look forward to seeing everyone again in 2016 for the 21st Biennial Conference on Aging.